(Yet another attempt at breaking the insanity-induced silence of this quarter – bear with me, y’all. I’ll be back on the ball soon). Instead of simply letting you try again after you crater, OCLS has taken the opportunity to refer players to a list of other gaming-related activities and materials (most of which link to items in their catalog). While Citricon cannot exactly be accused of encouraging a great deal of “library learning,” the question of whether and how much it should got me thinking about the gaming-in-libraries debate that’s been going on for years (I’ve largely been an observer of this conversation due to a lack of time to educate myself in gaming/learning theory, but this game inspired me to jump for the first time). I feel that this is an excellent example of using gaming as a draw and diversion-based incentive that eventually leads to other library programming, resources, and types of learning. In that sense, it is quite well done. On the flip side, I’m of course curious about the cost-benefit aspect of designing something like this – does OCLS contract out the development of this game, or employ a full-time gaming librarian? What is their analysis of their gaming program overall? Who will play Citricon, and how will they track its use? 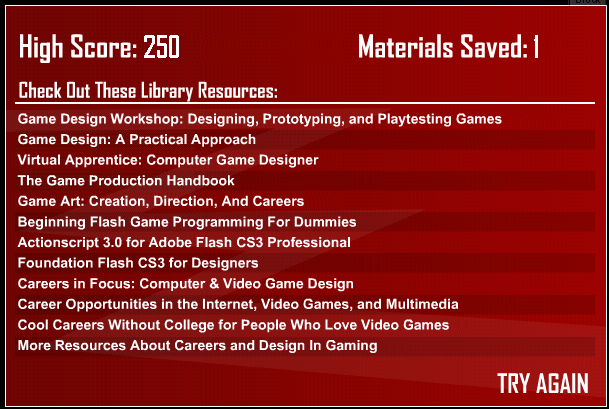 An older post from their blog shows that OCLS has received grants in the past to fund library gaming development, but I couldn’t find much information on this current initiative.